WHAT IF WE SAID YOU CAN WALK OUT THE DOOR WITHOUT HAVING TO FILL IN YOUR BROWS, ALREADY FULL AND READY TO GO?. 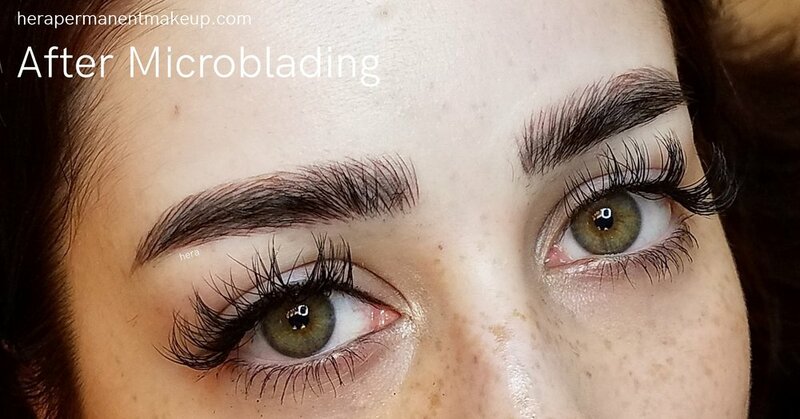 NOW YOU CAN GET THE MOST NATURAL NO-MAKEUP LOOK TAILORED TO YOUR UNIQUE FACE FROM SEMI-PERMANENT MICROBLADING OR MICROBLADING+EMBROIDERY COMBO. LASTING ON AVERAGE 1-2 YEARS, THESE TATTOOS WILL GRADUALLY FADE AWAY SO YOU CAN FOLLOW NEW TRENDS AND CREATE NEW LOOKS TO MATCH YOUR CHANGING FACE. EACH STROKE AND SHADING IS CAREFULLY APPLIED WITH ONE TIME USE DISPOSABLE HAND NEEDLES. mICROBLADING IS A FORM OF TATTOO THAT UTILIZE HAND NEEDLES, CREATING INDIVIDUAL HYPER-REALISTIC HAIR STROKES. INCREDIBLY NATURAL WHILE CAPABLE OF CREATING AN ENTIRE NEW IMPRESSION, THIS LIFE CHANGING COSMETIC TATTOO IS JUST WHAT YOU NEED TO WAKE UP WITH AN EFFORTLESSLY FINISHED LOOK. MICROBLADING+EMBROIDERY COMBO(m+e COMBO) IS AN ADDITION TO STANDARD MICROBLADING WHERE THE ARTIST INCORPORATES A BASE LAYER OF LIGHT COLORED SHADING UNDER THE MICROBLADED LINES. M+e COMBO CREATES A MUCH FULLER AND NATURALLY BLENDED LOOK FOR THOSE WHO HAVE LITTLE TO NO HAIR OR BALD SPOTS THEY WISH TO COVER. M+E COMBO HELPS THE TATTOO TO LAST LONGER AND RETAIN A MORE REFINED SHAPE OVER TIME.